Home→Our Journey→On the Road→Do we, or don’t we? Do we, or don’t we? 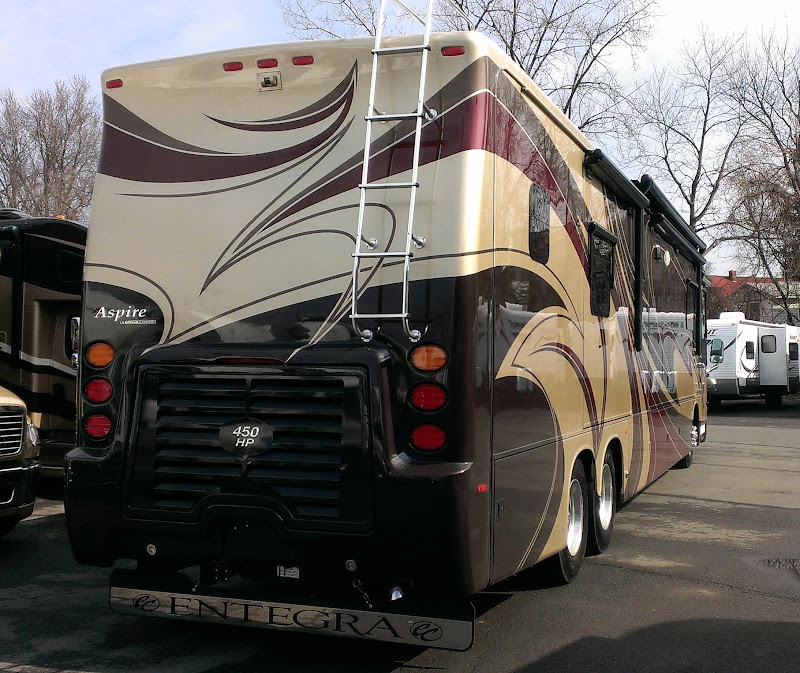 After visiting with Rob’s parents on Easter Sunday, we headed to Albany, NY where we had an appointment at Albany RV at 9:00 a.m. on Monday to inspect and test drive our (potentially) new Entegra Aspire 42RBQ. 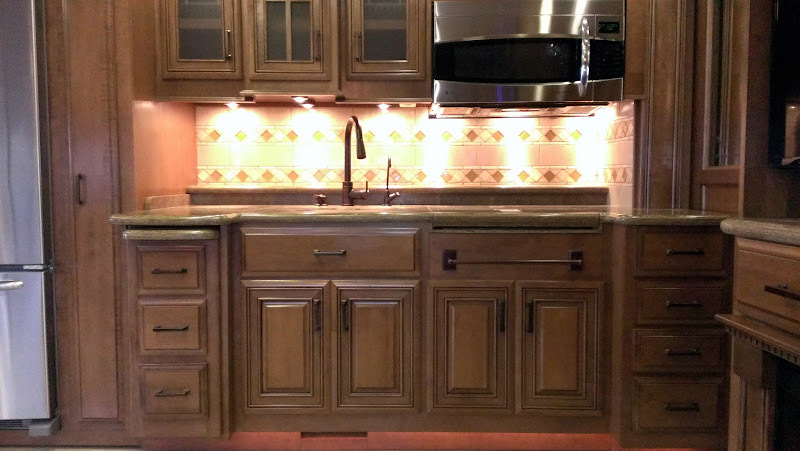 Prior to our previous trip to the Entegra factory in Indiana, we had put a deposit (subject to our inspection and a test drive) on a unit that they had on order with an anticipated May arrival date. However, the delivery date moved up several times and it arrived earlier than scheduled in Albany on March 27th. 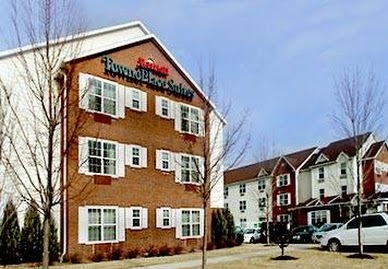 Since it was a three hour drive from home, we decided to travel out on Sunday and stay overnight at a local motel which was only 5 minutes from the dealership. Before checking in at the hotel, we decided to take a drive by the dealer lot even though they were closed – perhaps we could catch a glimpse of our new coach. Darn, couldn’t see anything! But as we took the next side street to turn around – there it was parked in their service area! Even though it was almost dark and overcast, it sure was pretty! The color scheme looked much better in person! After spending a few minutes taking some pictures, we headed back to the hotel where we had an uneventful comfortable evening. The next morning at 9:00 a.m. sharp, we pulled into the dealership where we were greeted by our salesperson, Laura. After a brief conversation, we headed over in the cold to the service area parking lot where we boarded the Aspire. 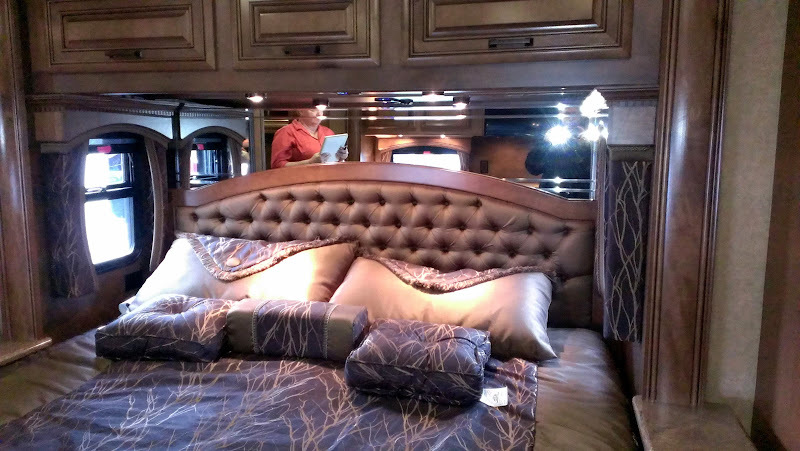 Even at the factory, we had not yet seen an Aspire with the exact colors we wanted – Autumn Berry exterior, Tuscan Glazed cabinets/wood, and the Cabernet collection of fabrics for the bedspread and valances, ultra leather on the sofas and chairs, and carpet in the rear wardrobe and under the sofas. All we could say was “Wow”! Totally loved it! After spending some time inspecting everything, now it was time for the next potential deal breaker – the test drive. All morning there had been dark clouds, well, just as we got off the coach to return to the office for a few minutes, the skies opened up and it started hailing! BRRRR! But luckily, it didn’t last long. Finally we were ready – Rob had to maneuver it out of the service area parking lot onto the rather narrow side street which he did with no problem. Off we went down the rather busy Central Ave, then took the ramp onto route 87. Rob had driven the Entegra Anthem when we stopped at the dealership on our way to Indiana so he expected that driving it would be similar. Although it handled slightly differently, Rob was happy with everything and oh yes it is very quiet! Guess it’s a go then! Note: if you ever visit Albany RV in your coach there is a low (12’6″) railroad bridge directly adjacent! DO NOT take a left out of their lot and do DO NOT arrive from the east on Central Ave! 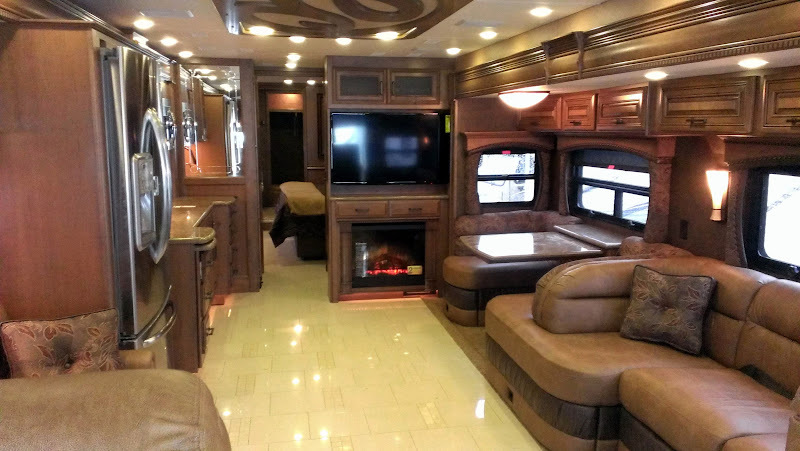 When we arrived back at the dealership, Laura told us we could spend as much time as we wanted in the coach, inspecting it for punch list items and taking measurements which we did. Before we left, we needed to complete some paperwork so around 2:00 p.m. we headed back into the office. Once the paperwork was done, we discussed what would happen next. It would take the dealership about a week to prep the unit and then we could pick it up at our convenience. 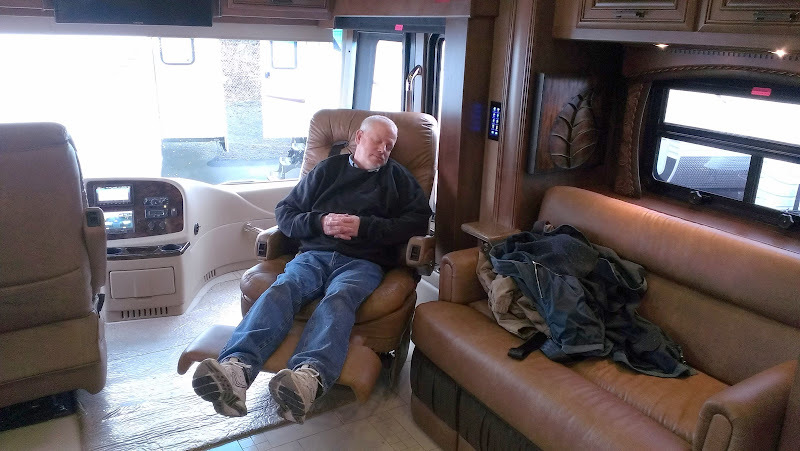 A technician would spend several hours with us going over everything on the coach before we could drive away with it. We picked Friday, April 12th at 10:00 a.m. as our “demo” date. After all that excitement, we finally hit the road to head home after stopping at a Wendy’s nearby for a quick lunch. This particular Wendy’s could not be classified as “fast food” – a family of 12 had just arrived ahead of us so we waited at least a half hour before getting our burgers! Finally we left the Albany area. Remember how we ran into snow all the way home from our trip to Indiana! 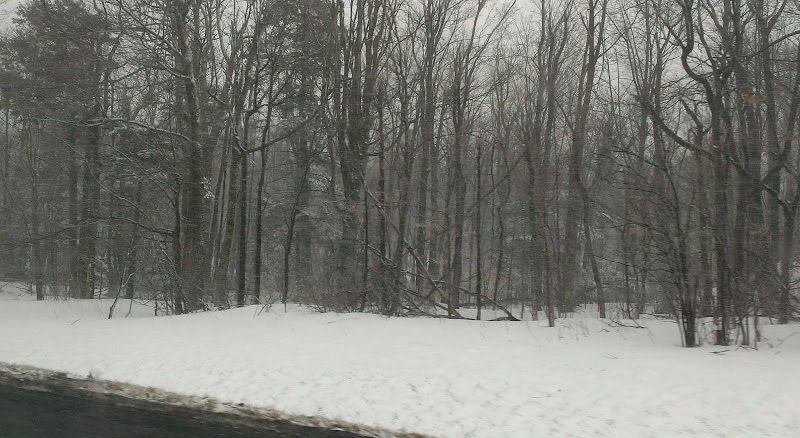 Well, as we got closer to the NY/MA border, it started snowing! The temps dropped from the morning’s 55 degrees to 30 degrees! 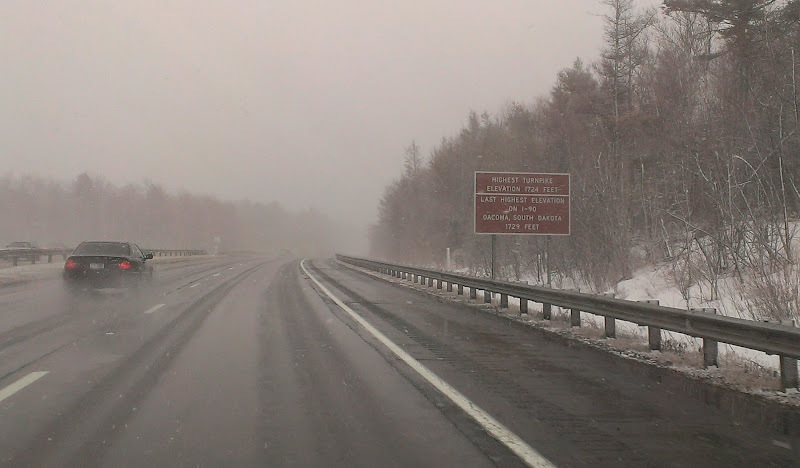 Once we were on the MA Pike, it was snowing heavily with nearly white out conditions and started to accumulate. Again? Really? C’mon, Mother Nature, can’t you give us a break? 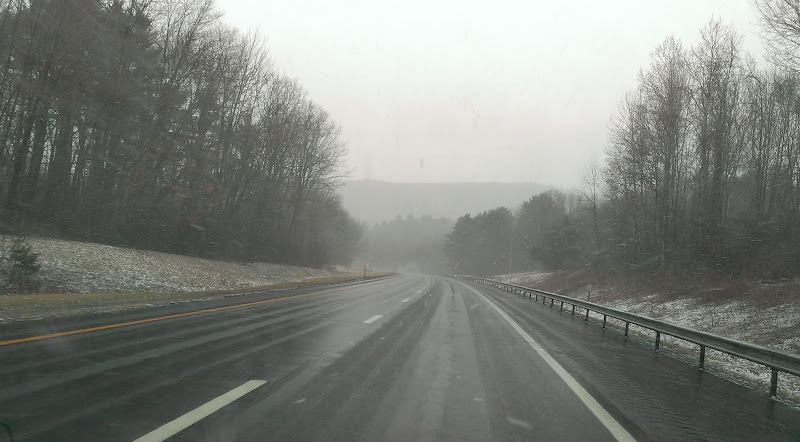 It pretty much snowed for an hour, about the entire time we were at the higher elevations in the Berkshires and didn’t let up until we came down out of the mountains. Our delivery date is a week away and the long range forecast is for rain. Guess we’ll never see Albany in the sunshine! But who cares, we’ll be driving away in a new Entegra! I can almost smell the leather. Hope you plan to have your car in tow back from Albany. CONGRATULATIONS!!!! 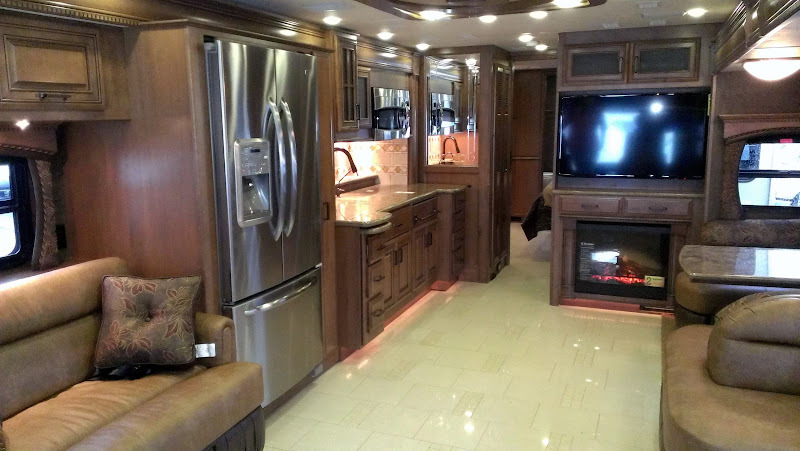 This must be the year for getting new RVs; we both traded in our Revolutions! Since Tim’s dad travels with us, we decided we need bigger accomodations to winter in Williston, FL. 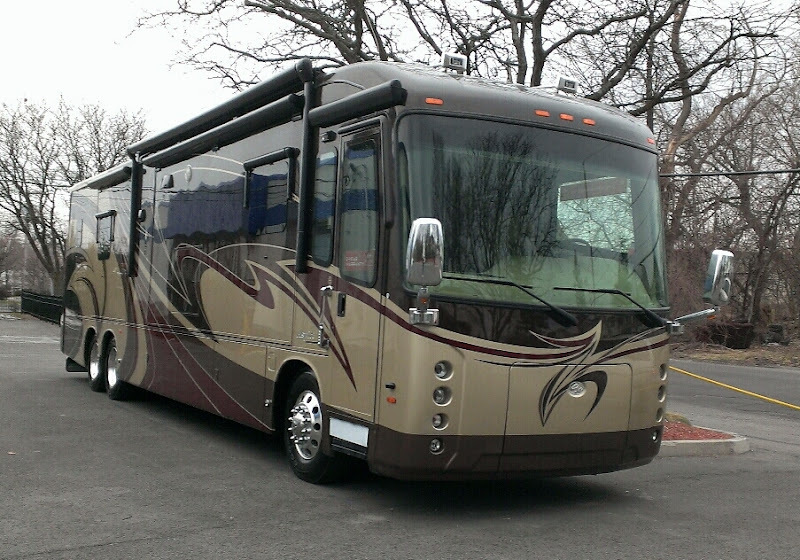 We got a 2012 Monaco Diplomat; only 10,000 miles, full wall slide on roadside, 2 curbside, fireplace, washer AND dryer ( love those ) and so much more. Enjoyed seeing the pics of your new coach; BEAUTIFUL!! We’re so happy for you. Enjoy your new ride and be safe!!!! Tim & Sue Medley ( we met at Williston Crossings RV Resort in 2011; sometimes it’s difficult to remember people if you don’t hear from them all the time; at least for me!!) We love following your adventures. Our Congratulations on your new coach! It is a beauty and we know you’ll be VERY comfortable in it. I love the colors and arrangements inside. Hope to see you next season. Congratulations! Looks great! Good luck and have fun with it! !